This simple, low cost project creates beautiful Tissue Paper Windows -perfect for hanging in any sunny spot. Tear off a long sheet of wax paper. You want to a sheet of wax paper twice as long as you would like your finished window. I use about 2 feet of wax paper per window. Help your little artist cut shapes from the tissue paper. If you artist is not mature enough for scissors, then cut many squares (1-2 inches) and rectangles from the tissue paper before you begin. Encourage your little artist to cover one side of the wax paper with the tissue paper squares and/or shapes. Layer colors and try to fill up the entire space. When your little artist has finished gluing, fold the wax paper sheet in half, with the tissue paper collage sandwiched inside. Seal the edges using the tape. You can also use the tape to create a even border for the window (see images below). Punch a hole in the tissue paper window and hang in a sunny spot. 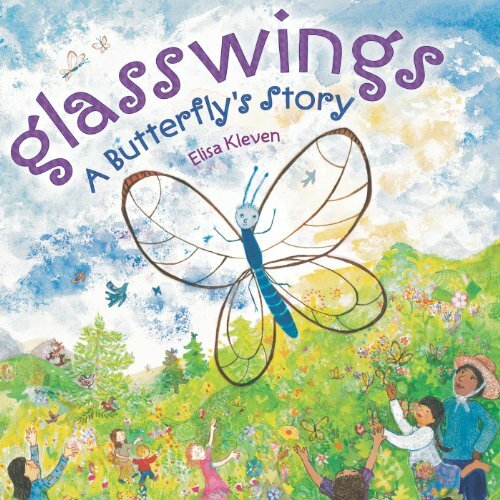 Before or after your tissue paper windows project, read the book Glasswings: A Butterfly’s Story by Elisa Kleven together with your little artist.